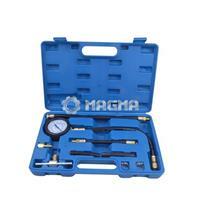 Comprehensive kit of adaptors and fittings for modern Schrader test-port fuel injection systems. Components fitted with quick coupling system and satety valve to prevent inadvertent discharge of fuel under pressres. High pressure, dual scale guage reading 0-145psi and 0-1000kpa with hanging hook and protective bumper.